Summary: Eve and Cooper Morrison are Savannah’s power couple. They’re on every artistic board and deeply involved in the community. She owns and operates a letterpress studio specializing in the handmade; he runs a digital magazine featuring all things southern gentlemen. The perfect juxtaposition of the old and the new, Eve and Cooper are the beautiful people. The lucky ones. And they have the wealth and name that comes from being part of an old Georgia family. Eve’s sister, Willa, is staying with the family until she gets "back on her feet." Their daughter, Gwen, is all adolescent rebellion. And Cooper thinks Eve works too much. Still, the Morrison marriage is strong. After twenty-one years together, Eve and Cooper know each other. They count on each other. They know what to expect. But when Cooper and Willa are involved in a car accident, the questions surrounding the event bring the family close to breaking point. Sifting between the stories—what Cooper says, what Willa remembers, what the evidence indicates—Eve has to find out what really happened. And what she’s going to do about it. 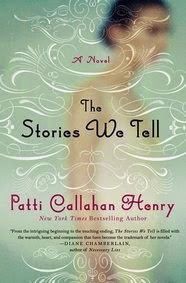 During the summer, I tend to read even more women's lit than usual, and one novel that I recently enjoyed was THE STORIES WE TELL by Patti Callahan Henry. I've read a few of her novels in the past, and I always appreciate how she writes touching stories with well-developed characters. I think she hit the mark once again with THE STORIES WE TELL. In this novel. Eve has been married to Cooper Morrison for decades with a teenage daughter Gwen, and their lives seem to be too good to be true. Eve has created a successful print business and her husband runs a digital magazine focusing on the Southern gentleman. Cooper comes from old Southern money and the have a lovely house and circulate in the wealthy circles of Savannah. Not too shabby for a girl who a preacher's daughter! However, Eve's life isn't perfect. Gwen is a teenager who is definitely challenging Eve's authority. She has a boyfriend that Eve doesn't exactly like and she sneaks out of the house to see him. Cooper isn't all together supportive of Eve's business -- most likely he's jealous of her success. And her sister Willa is staying with them until she can get her life turned around. But overall, things are good for Eve. And then one night, there is a car accident involving Cooper and Willa. Eve tried to make sense of the accident, but between Cooper's evasive story and Willa's memory loss, nothing is adding up. Eve is determined to get to the truth... even if that means discovering things about her loved ones that could ultimately destroy her family. I enjoyed THE STORIES WE TELL, and overall, I thought it was a pretty good book. I wouldn't go so far as to say I loved it, but it's a good, quick read to pack in your beach or pool bag this summer. I found the story to be entertaining and many of the characters were interesting, and I loved the setting of Savannah; however, I don't think that this is one of those books that will remain in my thoughts for a long time. There were a few things that I did appreciate about THE STORIES WE TELL. First, I liked some of the major themes of the novel. One of the main themes that the book explored was trust and I found it interesting to see Eve try to figure out what happened the night of the accident. The fallout she experienced from learning that her husband wasn't honest about that night (or a few more things for that matter) was well done, and I liked that Eve was determined to learn the truth rather than hiding from from it. In addition, I liked how this novel explored the concept of memories. When Willa has brain damage from the accident, she isn't able to recall many events from that night; however, she also has some other memory issues that she had to deal with. I have always found it interesting how individual choose to remember things and how these memories change over time. As a result, I liked seeing Eve reflect back on her life and how she saw things in a different light. Ms. Henry is a beautiful writer and I thought that showed through in THE STORIES WE TELL. I appreciated how she delved into some very complex relationships and created some unique characters. One small complaint that I had, though, concerns some of her character development. I felt as if Cooper and his parents were flat and too predictable. In addition, I had a hard time getting a grip on Eve at times. One minute she was the "perfect" wife and mom and the other she was fantasizing about her employee. It was just a little confusing and some of the messages she sent were a little mixed. THE STORIES WE TELL deals with many interesting relationships and would definitely make a good book club pick. There is a reading guide with fourteen thought-provoking questions that would definitely help initiate conversation. Some of the things you might want to explore include marriage, memory, loss, lies, trust, parent/child relationships, appearances, and creativity. I liked THE STORIES WE TELL and it did explore some special themes. I recommend it to fans of Southern fiction and women's lit. Thanks to Sullivan and Partners for providing a review copy of this novel. It sounds like there's a lot to like in this book! I usually like a southern setting and there are some good themes. Too bad some of the characters weren't stronger. I've read mixed reviews about this one. Not sure I will try it since there are SO MANY books I want to read this summer.